This was one of the tough films to make, since so much has been said about this case in media. It doesn't have much scope for creative freedom. Yet, if Meghana Gulzar chose to take this challenge, she should have lived up to audience expectations. I wasn't entertained by watching this film, but definitely it informed me about the case clearly like a well made documentary. Screenplay and editing were 2 weak areas, which could have been done better. I strongly feel that if Vishal Bhardwaj would have directed it as well, he would have done a much better job. This film has some impressive ensemble like Neeraj Kabi, Konkona and Tabu. All these great actors were wasted in the film due to lack of much screen presence. 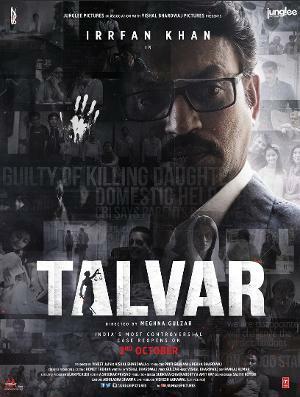 Irrfan is the only reason, why someone might appreciate this film. He is a marvel, who can make any role lively even within such limited scope. Thank God, film didn't have any songs as they would have completely killed the fast pace of film. Some people might argue that film should not have taken sides with one group of suspects. But, I think of it as director's cut and her version of story which she believed in. Unfortunately, media is too influential in our country and most of the audience would also believe in this version of truth. Does that influence actual proceedings of the case? It would be interesting to watch how it turns out to be. Verdict: Watch it as a documentary and not as a film. It will leave you with a heavy heart and disturbed mind, so watch it at your discretion.